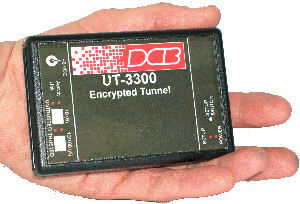 Note: The UT-3300 encrypted ethernet tunnel has been replaced with the new UT-3302 model. The new UT-3302 increases performance to greater than 10 Mbps, adds new features, and is fully interoperable with the older UT-3300 with no price increase. See the data sheet for this exciting new product here! The UT-3300 creates an encrypted tunnel through IP networks. It features three Ethernet LAN ports, USB ports, mini-pci wifi cards, and a serial port which is used for initial setup. The UT-3300 encrypts data between private networks using the public Internet or any other UDP/IP network as the transport. The UT series products operate in server-client pairs (or using multiple clients and servers in a system). 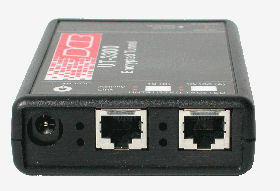 The UT-3300 can be a server unit for other UT-3300s or UT-6602s. The UT-3300 can also be a client device bridging it's local LAN to another UT-3300 or UT-6602 configured as a server. The UT3300 supports up to 8 client UT locations, the UT-6602 supports 50 client UT units. Other models support 100 or more remote UT client locations. The UT-6602 is the higher performance companion product. It's data sheet is here. The UT-3300 trusted port is ethernet 10/100BaseT. The WAN, or untrusted, data port is a 10BaseT ethernet port. WAN port data can be sent encrypted or unencrypted. The serial port is used only for setup. Due to the encryption employed in these products, UT series products are export controlled items and are regulated by the Bureau of Industry and Security (BIS) of the U.S. Department of Commerce. The UT-6602 and UT-3300 are classified as mass market encryption devices and may not be exported or shipped for re-export to restricted countries in Country Group E:1. They are shippable to most other countries. Power requirements: 12 VDC, 500 ma. Note: The UT-3300 encrypted ethernet tunnel was replaced with the new UT-3302 model. The new UT-3302 increases performance to greater than 10 Mbps, adds new features, and is fully interoperable with the older UT-3300 with no price increase. See the data sheet for this exciting new product here!